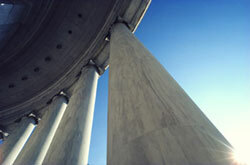 The Law Offices of Stephen J. Dunn have handled numerous cases which encompass many aspects of Federal Law. Some cases we also handle are Defense Base Act (DBA) cases and Tennessee Valley Authority (TVA) workers’ compensation cases. Employees that fall under the Defense Base Act are employees of a U.S. Government contractor or subcontractor that is located overseas. The U.S. Department of Labor, Office of Workers’ Compensation Programs (OWCP) Division of Longshore and Harbor Workers’ Compensation, administers the Defense Base Act, so that workers’ compensation benefits are provided for covered employees. If you are an employee of a contractor of the U.S. Government and are injured while working overseas, please contact us for a consultation as to what benefits we may be able to secure for you. Tennessee Valley Authority (TVA) employees are federal employees covered by the Federal Employees’ Compensation Act (FECA) and are eligible to receive workers’ compensation benefits. If you are a Tennessee Valley Authority Employee who has a work-related injury, please contact us for a consultation. Even if we have not specifically touched upon that part of the law on our web page, we may still be able to represent you. Contact us today to see how our experienced federal employment law firm can help you with your federal matter.